This will be my 7th year urban homesteading and 3rd year as a workershare/intern. I'm also working on a Certificate for Sustainable Food and Farming that should be completed this fall. I'm pretty into our local food scene and cooking traditional foods as well....so I hope you don't mind mixing all of my interests into my homestead thread. I suffer from SAD, so things really slow down around here in the winter. But now that the sun is back out and we're getting some warm days, I have my energy back. I'm cooking more and am doing lots of fermenting. 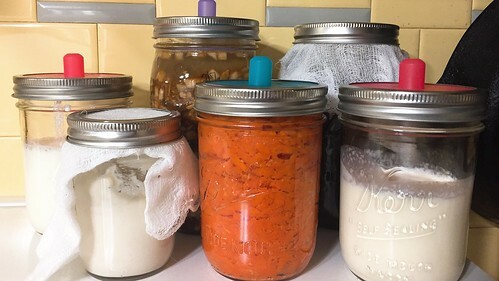 This is what I currently have going: milk kefir, apple chutney, kombucha, sourdough, ginger carrots, and piima. The workload for my Pastured Poultry class has been very high, averaging 1-2 chapters a day from one of our 4 textbooks, so this is how I've been spending a lot of my time. I'm really glad our main text is Joel Salatin's book though. I like his writing style and methods, so the reading goes faster. This week I registered for classes for the 2 short summer semesters. I'm doing Soil Science and Management and Raising Dairy Goats Naturally. I'm in Zone 5b, so it's finally time to start seeds! Broccoli, Cabbage, Kohlrabi, Oregano, Paprika Peppers, Hungarian Heart Tomatoes, Costoluto Genovese Tomatoes, Black Beauty Tomatoes, Soloar Flar Tomatoes, Basil, and Parsley went in on Sunday. And finally, this recipe is one I originally tried in 2012 and forgot about until my facebook memories reminded me of it this week. I brought it back into the rotation because it's super filling and all but one ingredient is always stocked in my canning pantry. Last edited by vigilant20; 03-22-2017 at 07:13 PM. I will enjoy following along as you share your happenings. Sounds like you are learning a lot! I would love to hear more about it. It's still very early in the season here, but the green onions are juuuuust big enough to start harvesting...so I celebrated with a special treat. It may just be becoming a tradition now that I'm thinking about it. The first little seedlings for broccoli, cabbage, kohlrabi and a few early bird basil and tomatoes. Outside, the strawberries, comfrey, rhubarb, and chamomile are also greening up. And I've got my kombucha factory up and running! I did chopped strawberries in my first bottles. This batch I'm trying pureed blueberries. You are obviously studying and receiving both classroom instructions and practical experience both, but workshare/intern is not something I am familiar with. I understand one being an intern, and alone I believe I understand the concept of work share also. Are you basically speaking about what is often referred to as a 'stipend'? Also the Certificate, you mentioned, is that the equivalent of a degree?, associates degree? Just trying to understand terminology, I've not encountered before. I am a workershare working for a share of produce. But I'm the only workershare and my farmer enjoys teaching so it's more on the educational side like an intership. If I continue my education she'll work with me for an official internship to count as credits for school. A certificate is a step below an associates. All credits will count towards an associates if I choose to continue my studies, but I'm not sure that'll be necessary. Both are valuable, but practical experience trumps book learning, in my opinion, but depending upon what one wishes to do determines the books value. I had not previously been exposed to the specific terminology you were using. Thanks for educating me on the language. The associates degree came into usage after I was through school, which makes me a dinosaur, I guess. Last week I started my workershare season. I spent my shift picking and washing spinach. This week I hoed the rows and paths in one of the greenhouses. Now that I've spent more time working with her diamond hoe, it's moved to the top of my wishlist. It's great! That means the balancing act between farm, home, homesteading, work, and school has begun. I've got 5 weeks left of spring semester, then things get really crazy for the two short summer semesters. At home, I'm doing a better job in the kitchen. 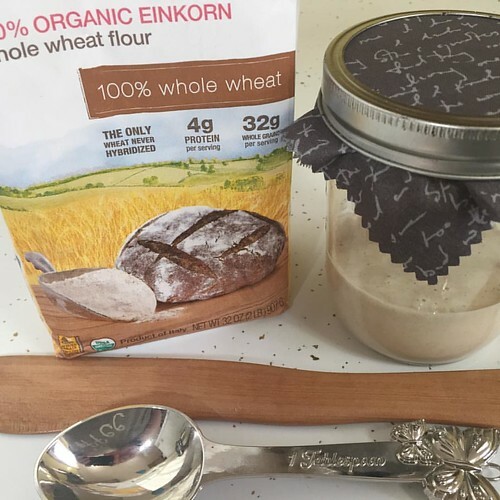 I've been keeping a flour sourdough starter and using it with fresh milled einkorn when I bake. But I've decided to start keeping a little einkorn flour on hand for daily feedings so I can convert my starter over. On the homesteading front, my starts are big enough to start getting their big boy leaves. I hauled home some peat and will start amending the beds this month so they are ready for planing come Mother's Day. Work has been crazy. I'm currently fully booked into December and there's more work and projects coming that somehow need to be done before then. I'm taking leadership training and working on reading some books to help with my professional development. I'm also chasing a possible new position and had a final interview this week for a chance at less stress in my life. I'll look forward to hearing about your journey. This week I spent my workershare shift putting in these gorgeous baby celeries. Having carrots and celery through most of last season was probably my favorite thing about the CSA. 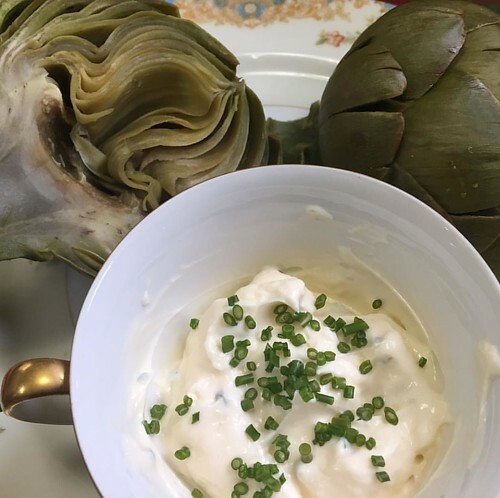 That and the artichokes! This months meat CSA basket has arrived. The chicken and steaks are already thawing. I've harvested the first of the asparagus. I'm currently down with a respiratory infection, but if I have the energy they'll be served with steak and rainbow new potatoes tonight. 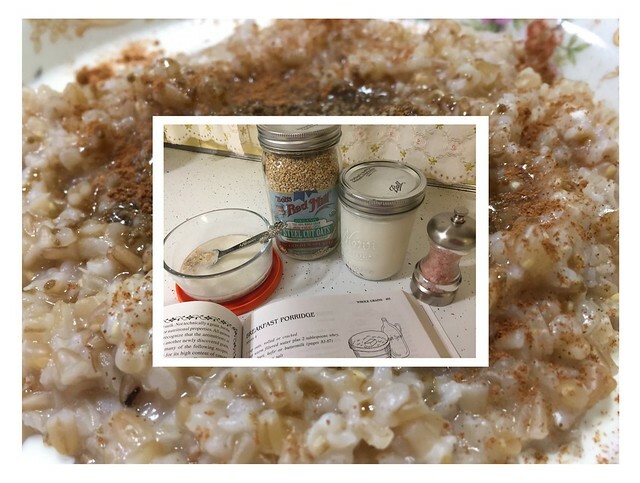 This weeks recipe is the soaked oatmeal from Nourishing Traditions. They have you soak 1/2 cup steel cut oats in 1/2 cup water with 1 TBSP acid (I used milk kefir but whey, yogurt, buttermilk or ACV work). Let sit overnight, drain and add a fresh cup of water and a sprinkle of sea salt and simmer about 10 minutes until tender. I served with raw cream, rapadura, and cinnamon. It all looks yummy! I just came in from planting broccoli and onions. Don't mean to sound dense, but what is rapadura? Rapadura is one of the less processed forms of sugar that retains the molasses. It's a little harder to find, but a step up from Turbinado and Demarara, which are more common in store, but have the molasses added back during processing. After a week of being sick with a respiratory infection, I'm up and about again. I just sound ridiculous and have a lingering cough. I managed to make it through a longer shift than normal to get peas planted with my farmer yesterday. Back home, I didn't get much done. I started harvesting the first little leaves on my lemon balm for some soothing teas. Out front, the peach tree is blooming and the apples look like they won't be far behind. Trim the tops and bottoms off of the radishes, and slice in half lengthwise. Saute radishes and green onions in butter in covered pan for about 5 minutes or until radishes are tender. Meanwhile, poach egg. Serve radishes on toast, topped with egg. Glad to hear you're feeling better. I'm just getting over a spring cold myself but of course the cough will linger for a little while. 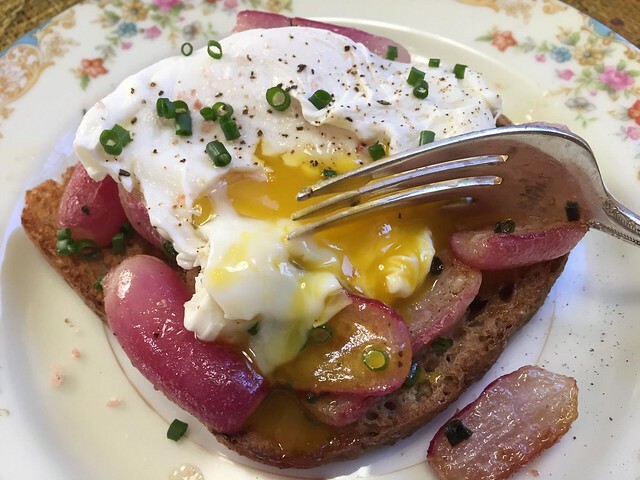 Those buttered radishes and poached egg look delish! Thanks for the recipe!